Some presentations and presenters of Christianity are, in my view, overly obsessed with the Death of Jesus such that they over-emphasise it, and end up marginalising the Incarnation of Jesus, the Ministry of Jesus, the Resurrection of Jesus, the Ascension of Jesus and the giving of the Spirit of Jesus. It probably wouldn’t be fair to use any label for the flavour of Christianity I inherited in my early years as a Christian. Whatever label is used, this version of Christianity is too prevalent. In this version I inherited, the only reason Jesus was born was to die for our sins. His ministry seemed like just some time-filling activity before he died. The Resurrection is like icing on the cake after the ‘main event’, his Atoning death. The Ascension is basically ignored altogether. And the gift of the Spirit is basically about empowering people to tell others that Jesus died for their sins. The New Testament, and the study and explanation of it over Church History, however, contains a Gospel that is much fuller than this version I inherited (and which most of our modern and quite a few of our older worship songs tend to focus on). The Incarnation of Jesus is not a mere stepping stone to the Cross (though it is not less than that). It is the Creator entering and uniting to the Creation in general, and human nature in particular. This, the Eastern Orthodox rightly emphasise, is itself a saving act. All creation participates in the salvation that Christ effects. The Ministry of Jesus does not merely fill time until the Cross. Jesus life and ministry is an enactment and fulfillment of genuine humanness. Everything that humans were meant to be and do, which was focused in the call of Abraham and his people ‘Israel’, Jesus achieved and demonstrated in his life. He finishes the race we could not. This is a saving act. The Resurrection of Jesus is not a mere happy ending to the Cross. Whereas the Cross entails Jesus taking Death (and Evil and Sin) onto himself and extinguishing it, the bodily transformation and translation of Jesus, the Resurrection, enacts and achieves the defeat of Death (and Evil and Sin). It also achieves a kind of ‘beachhead’ (or ‘first-fruits’) into New Creation, the ultimate destiny and intended goal for all Creation. This is a saving act – for all creation – including humans. The Ascension of Jesus is not an undoing of the Incarnation (which would be a huge heresy), where the Son of God strips off his humanity and reports back to the Father that the atoning death was accomplished (and thus the body no longer needed!). It is about the enthronement of Jesus to the place of ultimate authority – which among other things, entails a denial of any other entities claiming such ultimate authority. This is a saving act, saving us from false authorities. The Giving of the Spirit of Jesus is not simply a bit of personal motivation to tell people about Jesus dying for us (though it is not less than that!). It is the gift of the ongoing personal spiritual presence of Jesus, enabling us, correcting us, leading us, empowering us, shaping us to become more like Jesus. It’s not just about ‘evangelism’ (or exciting private experiences), but about becoming more human – more like the true human, Jesus. The Spirit of the true human, Jesus, makes us truly human. This ‘humanisation’ (or ‘re-humanisation’) is a saving act; it’s what salvation is all about. And that’s the “full gospel” that the New Testament communicates. Q: Why does no Roman historian mention Jesus’ resurrection!? Surely if something so extraordinary happened, they would have written about it!? I’ve the privilege of preaching the last passage in Luke (24:13-53) this Sunday night. Wow. What a passage! 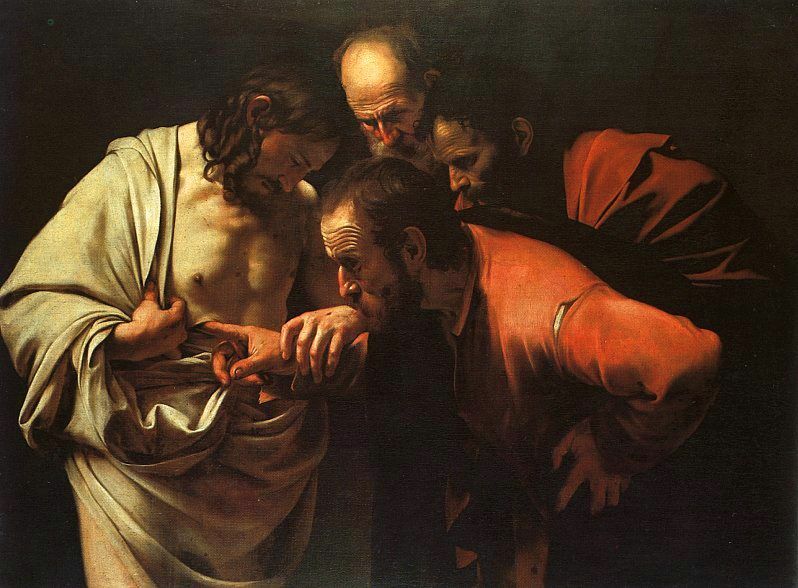 Just for the hey of it, here’s a painting by Caravaggio called ‘The Incredulity of Thomas’, based on this and the other parallel gospel passages. What a painting!